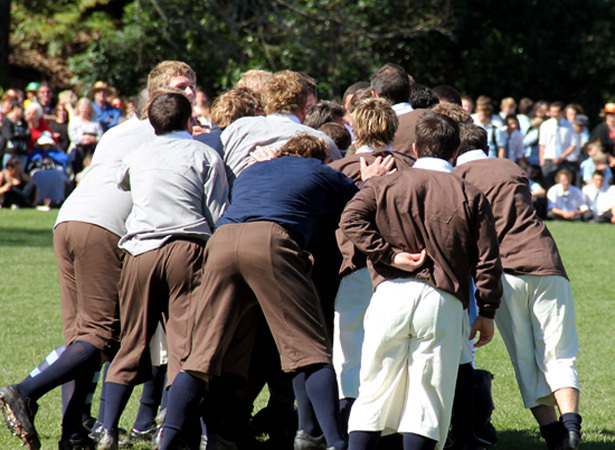 Around 200 people were on hand at Nelson’s Botanic Reserve to watch a new version of rugby football brought to New Zealand by Charles Monro. Nelson College played the Nelson Football Club, with 18 players on each side. The ‘town’ team, sporting ‘street clothes’, won the match 2-0. The term football was used to cover many versions of a team game in which a ball was kicked. Charles Monro had been sent to Christ’s College at Finchley in England to complete his schooling. While there he played the version of football associated with Rugby School. On his return to Nelson, Monro suggested that the local football club give Rugby rules a go. Now some player runs with it [the ball], and a general scrimmage ensues; it is all shove, pull, rush, and roll about in a confused mass till ‘down’ is cried, and away the ball goes again till perchance it gets in touch or caught. Later that year Monro organised a game between Nelson and Wellington and over the next few years rugby clubs sprang up across the colony. In 1879 the first provincial unions were formed in Canterbury and Wellington to administer and control the playing of rugby in their region. These were followed by a number of other unions, and in 1892 a New Zealand Rugby Football Union (NZRFU) was formed to administer the game around the country. We have 16 biographies, 6 articles, related to First game of rugby played in NZ.